Parts of the vehicle damaged in the incident. East Antrim MLA Roy Beggs has renewed his call for additional measures to prevent railway bridge strikes in Carrickfergus. 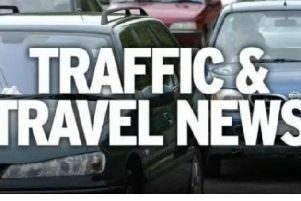 It follows a response from the Department of Infrastructure to correspondence over recent incidents at the North Road structure, which has resulted in the closure of the Larne railway line and blocked one of the Carrick’s busiest roads. The Ulster Unionist Party representative had asked the department for a significant upgrade in warning signage at the location so that visitors driving high-sided vehicles are less likely to get caught out. The DfI advised the MLA the department and Translink had carried out an audit of the signage on the approaches bridge in September 2016 and found it to be in accordance with current advice and best practice. In a statement this week, Mr Beggs said both NIR and DfI roads have assured him they will continue to monitor the primary cause of the bridge strikes. The railway bridge is subject to height restrictions which prevent vehicles of more than 3.3m passing underneath. 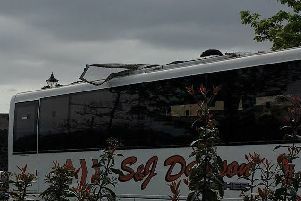 On Monday, May 14 a touring bus struck the bridge, which led to the latter being examined and the line deemed safe to remain open. It was the second such incident inside a week at the location. On Tuesday, May 8 a lorry became stuck underneath the bridge.